lt;stronggt;CWNNR0046GYlt;/stronggt;lt;BR/gt;4' x 6' Needle Rib Mat, Charcoallt;BR/gt;Keep those unwanted guestsdirt and moistureoff the invite list by using Needle Rib wiper/scraper mats. Rugged grooves and ribbed polypropylene needle fibers trap and hide dirt before it enters your home or office. Beveled edges reduce the risk of tripping, while a vinyl backing helps keep mat in place. Wear-resistant, color-fast design for light- to medium-traffic areas. For indoor use. 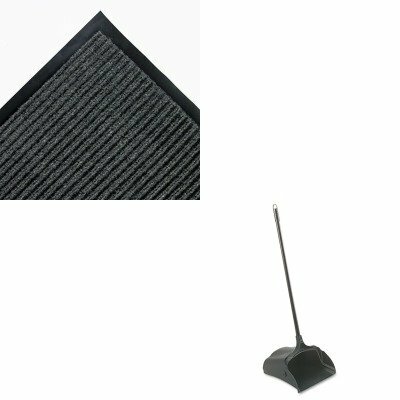 Mat Type: Wiper Mat Application: Indoor Materials: Polypropylene.lt;BR/gt;lt;BR/gt;lt;stronggt;RCP253100BKlt;/stronggt;lt;BR/gt;Rubbermaid-Black Lobby Pro Upright Dust Pan, Open Stylelt;BR/gt;Wheeled, vinyl-coated dust pan with superior durability and ergonomic safety features. Yoke and handle assembly with larger, stronger and quieter hinge pins. Durable wheels and wear pads on back of pan extend product life. Built-in handle on back of pan lets you empty without touching pan bottom. Ideal for use in malls, restaurants and lobbies. Will not stain, discolor or absorb odors. Materials: Polypropylene with Vinyl Coated Steel Handle Width: 12 1/2amp;quot;.